“Accidently?” Oh okay. That doesn’t sound suspicious at all. And I suppose you loaded that pistol ACCIDENTLY and then gave it to him ACCIDENTLY. I’m on to you woman. But…but..his finger’s nowhere NEAR the trigger. And I think the hammer would’ve clipped his pinky if it went off half-cocked. 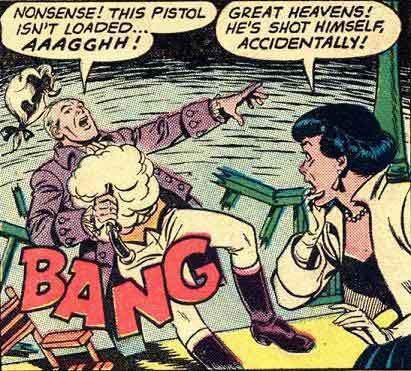 And how do you NOT know if you have a ball or not in your single-shot pistol? And it’s not pointed at him. And, and… and how did they hold on to Canada for so long? …and that’s a really flimsy boat. And is that a director’s chair? And hey Jeff, can you put that wig into HM3?